Mirette (with Tom Jones, lyrics, and Harvey Schmidt, music) is set in a boarding house in turn-of-the-century Paris that caters to a colorful group of music hall artistes ­— a juggler, dancer, trapeze artist, clown, Russian singer, and a pair of acrobats. A mysterious stranger arrives and when Mirette discovers him practicing on the wire, she begs him to teach her. He refuses, but Mirette practices on her own, and he finally agrees to teach her, impressed by her talent. Max, the impresario arrives and recognizes the mysterious stranger as the famous Bellini, “the greatest highwire walker of them all”, who tragically lost his nerve and went into hiding. Mirette challenges him, and Bellini resolves to confront his fear in a breathtaking walk over the rooftops of Paris. Mirette is an intimate musical for ten performers and one piano. It features Jones and Schmidt at their best. The story of teacher and pupil is universal and the world of the boarding house is captivating. Mirette was developed at the Sundance Playwrights Lab and produced twice at the Goodspeed Opera House and in many other theatres. Available from Music Theatre International (MTI) — mtishows.com — in both one-act and two-act versions. 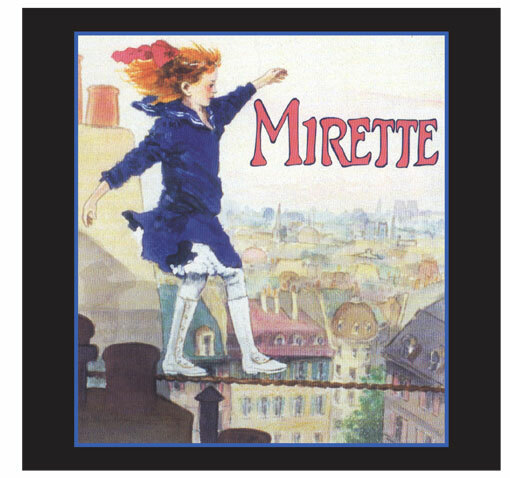 Mirette is based on the Caldecott Award-winning book Mirette on the Highwire by Emily Arnold McCully.